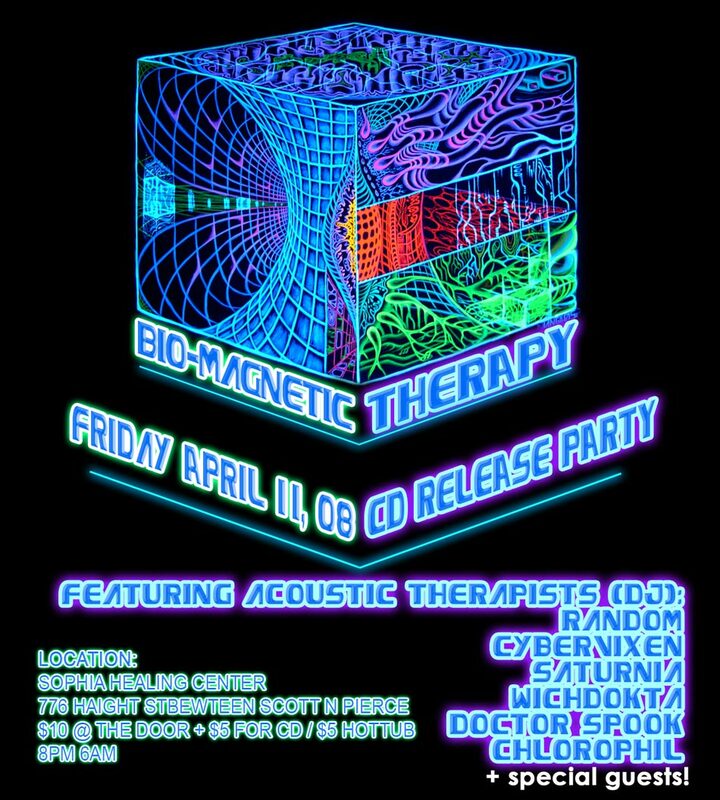 On Friday, April 11th, 2008, GeoMagnetic Records, Phoenix Family, and The Sophia Healing Center are honored to present the long awaited new CD compilation “BioMagnetic Therapy” from our own San Francisco based local artist, Random. In the safety and intimacy of this special venue we gather for a sacred session. Bio Magnetic Therapy is the scientific process of aligning your bodies’ internal magnetic fields to be attuned to the most efficient and healing frequencies. By attaining this harmonically precise state of being you automatically attain more awareness, higher consciousness and thus a higher potential for human understanding of their place in the universe. Geomagnetic Records presents this international compilation created by DJ/Producer Random for the express purpose of attuning your BIO MAGNETIC FREQUENCIES. He has chosen 10 specific attunement tools to help you maximize your potential and tune yourself and others to this highly desired state of being. $10-$20 ($5 CD/ $5 Hot Tub Pass) At the Door. 18 and up please. also FYI, Many CD stores across the usa such as Amoeba in Berkley, LA and of course SF are stocking lots of amazing new titles from our new san francisco based psy-distribution company www.goa-records.com. Some other great cd stores such as Cieba rec in San Francisco, The Works in Arcata and United Records in San Diego have also joined up in our out reach effort to bring psy-trance and psy-chill to the retails stores of the usa and in doing so reach out to many fans who are searching for this music just as we did not so long ago. =) As always the international retail stores support us by selling and promoting our releases. Please check out Saikosounds.com and Psyshop.com for more info.